Brush Bonanza! All prices include US shipping. Add $5 for international. All brushes have not shown any shedding problems, and are in very good/like new shape. 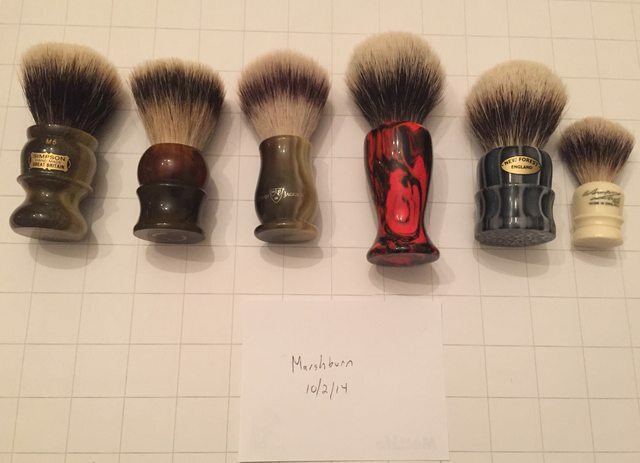 SOLD 1 - Simpson M6 Shave Nook LE brush: $150. #33 of 200. Manchurian knot. Only used twice. I paid $190 new. 22mm / 48mm. Comes with original box. SOLD 2 - Shavemac flat-top brush: $100. Silvertip 3-band D01 knot in a faux tortoise handle. Used less than 10 times. I paid 115 euros new. 22mm / 44mm. Flat top knots feel larger than their knot size. Comes with original box. SOLD 3 - Edwin Jagger Chatsworth Synthetic brush: $35. Same knot as the Muhle Silvertip fibre, in a faux horn handle. I'm the 2nd owner and paid $45. 21 mm / 55 mm. Comes with original box. 4 - Penchetta Flame brush: $50. Knot is a 24mm TGN Finest (2-band). I paid $70 new. Taller handle on this one. No original box. SOLD 5 - New Forest 2401 "Tigris Perla" brush: $40. High Mountain white knot. 2nd owner, and I think I paid $50. 24mm / 52mm. No original box. SOLD 6 - Simpson Wee Scott: $25. 2nd owner and I paid $30. Only used a couple times. Impressive little thing. 14mm / 35 mm. Comes with original box. Man I love that flat top Shavemac. Already spent my brush allowance. Someone will enjoy that! id love to get another new forest in that color! (10-04-2014, 03:27 PM)llalm Wrote: id love to get another new forest in that color! Contact "Fido" and ask him to make you one.